When Jose Soriano returned last year from a one-year tour in Iraq with the Army National Guard, he thought he would quickly get a job. Settling back in his hometown of Oakland with his wife and year-old daughter, Soriano applied at several security firms and retailers, a couple of police departments and some delivery services. “I would have taken pretty much any job, but nothing happened,” said Soriano, 23. Finally, Soriano landed a job, but it was only a seasonal position at a Halloween store. Like him, many Latino veterans are struggling to find work in the nation’s sputtering economy. The situation is expected to worsen as the wars in Iraq and Afghanistan wind down and more troops return home. One response is an array of Federal and state programs aimed at helping them get back on their feet. And many companies such as Home Depot, News Corporation and Northrop Grumman are also reaching out to veterans. But there’s evidence that many Latinos like Soriano are failing to take advantage of all of that help. “They just don’t know about all the programs and it’s our job to get the word out,” said Randy Noller, spokesman for the Department of Veterans Affairs. In testimony before Congress in September, Ted Daywalt, president of the job board VetJobs, said the bulk of the 66,000 unemployed veterans are, like Soriano, in the National Guard or reserves. “Due to the constant activation of National Guard brigades and to a lesser extent of Reserve personnel, upwards of 65 percent…of employers will not hire as a new employee an active member of the National Guard and Reserve. The result is the exceptionally high unemployment rate of young veterans.” Daywalt said. Latino veterans are among the hardest hit by unemployment, according to Labor Department statistics. Veterans of the conflict in Afghanistan and the latest war in Iraq had an unemployment rate of 11.5 percent last year. Among Hispanic vets, that rate was 14 percent. “One reason they are more vulnerable [to unemployment] is that they’re just not as boisterous at selling themselves,” said Ismael “Junior” Ortiz, who runs the Labor Department’s Veterans’ Employment and Training Service. Ortiz also said lower education levels among enlisting Latinos---and the higher unemployment rate for Hispanics in general---may account for their higher veteran jobless rate. “Overall, when you start at a base that’s much lower, it’s harder to pull yourself up,” said Ortiz, a retired Marine officer. For the nation’s youngest veterans, Hispanics and non-Hispanics aged 18 to 24, the unemployment rate was a whopping 21.9 percent. (The Labor Department did not break down the jobless rate in that age group between Hispanic and non-Hispanic vets.) There are many reasons for the grim statistics, starting with the job-killing recession. Many young veterans signed up right out of high school and lack a college degree or the technical training needed to get a good job. Others suffer from injuries or post traumatic stress disorder (PTSD) which inhibits job searches. Some veterans are so well trained in military procedure and married to military jargon that they have trouble making themselves understood in the civilian world. “Veterans are bringing their resumes out and employers are not understanding what those resumes say,” Ortiz said. 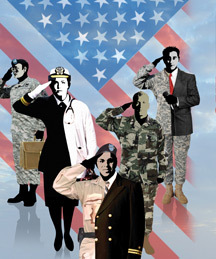 The Federal government helps returning veterans in many ways, from grants to those who are homeless to job counseling and a six-step “toolkit” for employers aimed at helping them connect with qualified veterans.Washington also encourages businesses to hire vets by giving them a $2,400 tax break for each one they hire who is disabled or from a low-income family. When President Obama proposed expanding that tax break during his September jobs speech to a joint session of Congress, it was one of the few times he received bipartisan acclaim. Obama’s proposed “Returning Heroes Tax Credit” would give $2,400 to companies for each veteran they hire who has been unemployed for less than six months and $4,800 for those unemployed for half a year or more. Companies hiring wounded vets who have been out of work for at least six months would receive a $9,600 tax credit. During a visit this summer to Washington’s Navy Yard, Obama unveiled a “reverse boot camp” program to help soldiers return to civilian life and set a goal for companies to hire or train 100,000 unemployed veterans and their spouses by the end of next year. The president’s new initiative involves documenting all the training that members of the Armed Services receive from the first day they report for duty. Those records would be reviewed by job counselors when troops are nearing their discharge date. If anyone lacks skills needed for a civilian job, he or she would get the necessary training. Job counselors would also help transitioning troops find the best field for their interests and skills. Ortiz has traveled the country this year visiting “Hiring our Heroes” job fairs. Working with the Labor Department, the U.S. Chamber of Commerce set a goal of hosting 100 job fairs this year aimed at finding work for veterans and their spouses. Ortiz said he tries to reach out to hiring managers. “I can talk to a CEO all day and then ask him ‘do you want to hire a veteran?’ And that CEO will say ‘yes, I do,’ Ortiz said. “But it’s not the CEO who does the hiring at a company.” At those job fairs, Ortiz said he puts “extra effort” to sell Latino job candidates. Some companies have been noted for their outreach to veterans. Northrop Grumman is high on G.I. Magazine’s list of the nation’s top 100 “military friendly” employers. Mike Sullivan is the program manager for the company’s “Operation IMPACT,” which seeks to hire service members who have been injured in Iraq or Afghanistan. They also employ the wounded warriors’ family members. According to Sullivan, a Northrop Grumman employee had a neighbor whose son returned home in 2004, badly wounded in Iraq. “He asked. ‘couldn’t Northrop Grumman help?’” Sullivan said. Since more than half of the company’s work comes from the Pentagon, Northrop Grumman felt an obligation to do something, and has since hired 96 wounded vets or their spouses. “We felt it’s the right thing to do,” Sullivan said. One of those hires is Ismael Escobar, a 31-year -old Californian who served two tours in Iraq with the Army and reached the rank of staff sergeant before he was diagnosed with PTSD. The Army determined he could no longer perform his combat duties and offered him other jobs. But for Escobar, the thrill of combat was why he joined the Army. He asked for a discharge and tried to find a new career as a civilian. “I joined the Army right out of high school and became a ‘ground pounder,’ an infantryman,” Escobar said. “When I got back to San Diego and started looking for a civilian job, I found out there wasn’t much need for a ground pounder.” As a discouraged Escobar was transitioning to civilian life at his base in San Diego, his squad leader pressed him to talk to representatives of Operation IMPACT who visited the base every Friday. “They really focus on you,” he said of Northrop Grumman’s recruiters who assessed his skills and goals. “They asked ‘What do you want to do?’ and my response was ‘I want to dress nice every day and sit in front of a computer for eight hours.’” Escobar was offered a job as a security analyst in the company’s northern Virginia headquarters and accepted it. His wife was also offered a position with Northrop Grumman, as an administrative assistant. So Escobar, his wife and three children moved to Manassas, VA. “If we’re given the tools and we’re given the resources, we can make it,” Escobar said of his fellow vets. Northrop Grumman is one of dozens of large companies including Goldman Sachs, Home Depot, IBM, Verizon and Pepsico that belong to American Corporate Partners, a non-profit that pairs veterans with business executives that serve as their mentors. The organization was founded in 2008 by a retired investment banker and has already mentored 600 veterans. “Returning troops probably don’t have a resume. They probably haven’t been on a job interview. We set them up with someone who can help,” said Brett Sheats, manager of veteran outreach for American Corporate Partners. Renzo Garcia, 31, was mentored by Dennis Swanson, a former Marine and now a senior executive at News Corporation. A former Army staff sergeant from New Jersey, Garcia was having trouble reintegrating into society after six years of active duty on rapid response teams in Afghanistan and Iraq. “He not only mentored me, but helped me with the tough time I had dealing with things,” Garcia said. Swanson sent up meetings between Garcia and Fox television executives who helped him conduct mock interviews and polish his resume. In the end, one of those executive hired Garcia as a sales assistant. Swanson said he had hoped to mentor a Marine. But Garcia’s job in the Army impressed him. “You don’t get to be a staff sergeant in the Rangers if you don’t know what you’re doing,” he said. When he began mentoring Garcia in January of 2010, he realized he had to tutor the vet in more than the nuts and bolts of getting a job. “[Garcia] wanted to know about me and how I got where I am,” Swanson said. “I told him that in America you don’t have to come from the right family to be a success---I went to public schools and put myself through college. I told him that was what he was fighting for and he took heart at that.” When the year-long mentoring course was nearly over, Garcia asked Swanson if he would continue to help him. Impressed with what he viewed as the young man’s potential, Swanson responded,“I’m here for you.” Some companies, like Home Depot, do more than mentor returning troops. They actively recruit veterans. Out of the company’s 300,000 employees, 35,000 are veterans. Home Depot spokesman Stephen Holmes said another reason his company has a reputation for being “military friendly” is that it provides military spouses with leaves of absences when their partners are on leave. For Holmes, recruiting and retaining veteran employees is a win-win situation. “If you think of the type of employee we need at a Home Depot store, hiring veterans makes a lot of sense,” he said. “Veterans are very dependable, they are service oriented, solution oriented, very courteous and have a mindset for solving problems.” The company also hosts welcome home celebrations for associates who return from active duty, provides opportunities for military associates to transfer to another store if they’re reassigned and has a dedicated web page to promote military hires at http://careers.homedepot.com.edgesuite.net/our-culture/military-commitment.html.